This report is a summary of graph analysis of engagements and conversations including retweets, mentions and replies over 1.5 months on Twitter around Blockchain. Data & Duration: The report uses over 1M tweets sampled from 1st August to September 20th. This along with Right Relevance topics and topical communities’ data form the basis for the analysis. The analysis of Blockchain conversations, during the above time period, bubbled some themes to the surface as the primary ones driving engagements during the above timeframe. Application of Blockchain to IoT and Smart Systems. Open and integrated standards for Blockchain, IoT, AI etc. This is noticeable because it stands out in contrast to our prior analysis (in June 2016) when the DAO hack became big and a vast majority of the main themes were around technology, ethereum and the security & sanctity of blockchain with developers/technologists being the primary players. Measuring influence is not deterministic. It’s a fairly subjective task with numerous different methodologies and is generally ephemeral in nature. ‘engagement influence’ or Flocks by measuring quality and quantity of engagements (RTs, mentions, replies), reach of tweets etc. within the context of an event or trend. Right Relevance algorithmically mines social media (esp. Twitter) at scale to produce a measure of influence per topic which we call ‘topical influence’. We use unstructured text, network analysis, social signals along with semantic data, ML, NLP among other to produce: a set of ‘structured topics’ (~45K) with semantic information and; a connected graph of scored ranked influencers for each of these structured topics we call ‘topical influencers’ or Tribes. For e.g. 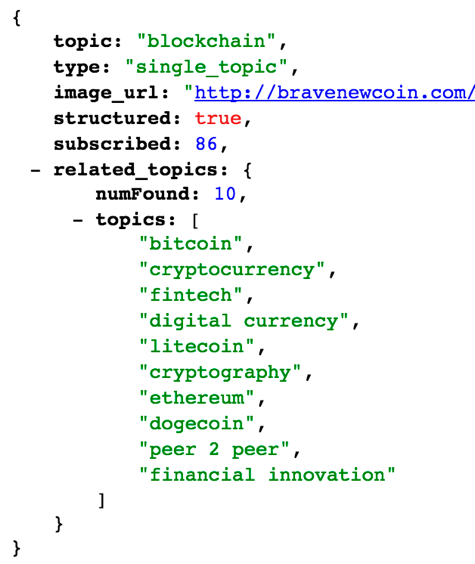 ‘blockchain’ is a structured topic in our platform with the following metadata (Figure 1) returned by the RR Topics Metadata API of the RR API offering. The top 10 related topics include bitcoin, cryptocurrency, fintech and digital currency. 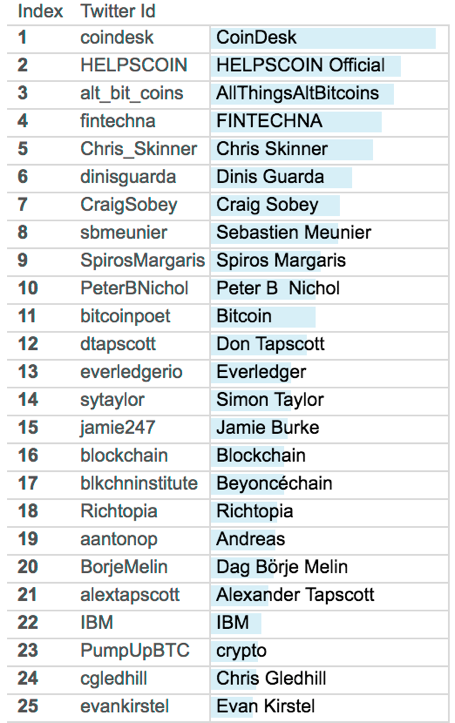 Right Relevance also identified ~3K scored ranked set of blockchain influencers on Right Relevance. The top 5 are listed in Figure 2 below. We apply several graph analysis methods including PageRank and Betweeness centrality to measure the quality and quantity of engagements (RTs, mentions, replies), reach of tweets, connections etc. within the context of an event or a trend. This leads to a measure of Influence which is in the context of the engagements around the event/trend being monitored and is thus temporal in nature. We call the influencer communities detected in this manner as Flocks considering the flocking nature of their behavior. There are several ways of ranking within this methodology and are documented here. Figure 3 is a table with a list of the top 25 accounts by PageRank and overall rank on engagements. Overall rank is a normalized rank to reduce the skew towards users with large numbers of followers or a single tweet having a large number of retweets (often referred to as becoming ‘viral’). 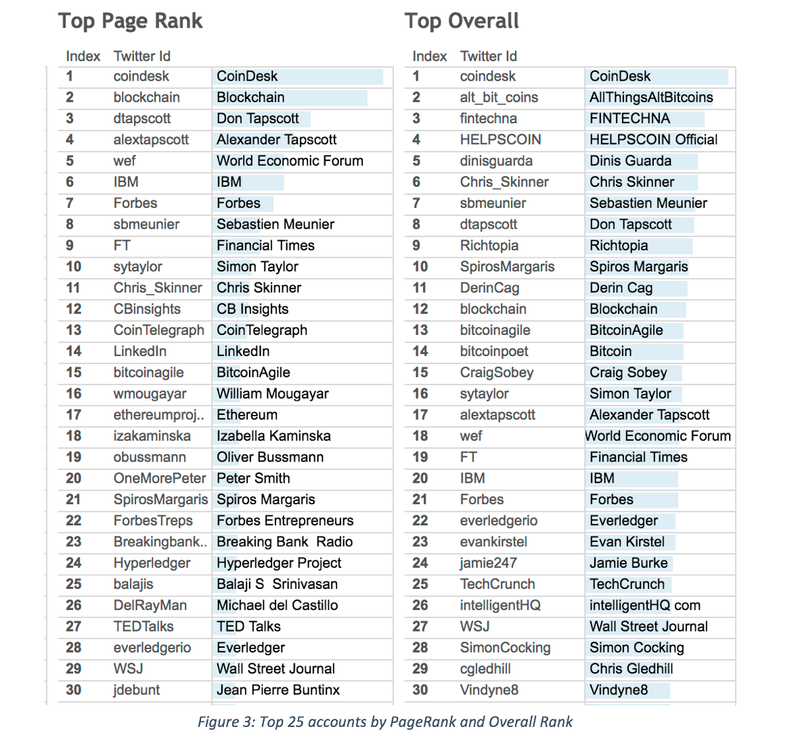 PageRank brings out the usual suspects like @coindesk, @blockchain and @dtapscott along with high reach accounts like @wef, @ibm and @forbes showing the susceptibility of PageRank to high followers/reach. The top overall, due to the normalized nature, gets rid of that bias and bubbles up several players in the blockchain space like @fintechna, @dinisguarda, @chris_skinner, @sbmeunier who may otherwise be tough to discover. In both cases, top accounts @dtapscott, @alextapscott, @wef, @ibm, @forbes @dinisguarda @chris_skinner are related to one of the major themes listed above, application of Blockchain technology to business, finance, banking and digital economy. Betweeness centrality is a measure of the degree to which a node forms a bridge or critical link between all other users. We use it as a measure of influence of users wrt their value in being communication connectors from the point of view of various and varying Twitter conversations. @coindesk is one of the top accounts in the digital currency, bitcoin, blockchain space and their Twitter account is focused on disseminating news. It posts about and engages in several relevant conversations across various topics and communities. This, based on how betweenness centrality works, leads to it becoming a top connector. The next 3, @helpscoin, @alt_bit_coins and @fintechna are very similar since they too act as news dissemination sources. But, the next few accounts are extremely interesting and surface names of people, who have gained a lot of value as connectors, and would be potentially hard to find. @Chris_Skinner, @dinisguarda, @CraigSobey, @sbmeunier, @SpirosMargaris, @PeterBNichol, @dtapscott are primarily bloggers, speakers, authors, advisors, consultants in the fintech, digital economy space. They are all connected to one of the top themes we noticed wrt blockchain applications to business, finance, banking and digital economy. This makes them very useful as contact and communication hubs for blockchain esp. as it relates to business and finance. Another view to understand influence is to plot reach (followers) against a normalized measure we call rank. This is another great way to dampen pure follower based metrics and bring out users that hold more sway within the community itself. We had to trim @coindesk since it was off the charts wrt both reach and rank to enable us to show the other users more clearly. The high follower accounts like World Economic Forum, WSJ, Forbes, Bill Gates etc show up with high Reach but are either below or very close to the line diving Reach from Rank. Their influence in the blockchain space is marginal at best but when they do speak the get a lot more audience as expected. The “connectors” group of bloggers, advisors etc. like @dinisguarda @chris_skinner @sbmeunier et al as measured by betweenness centrality above, have managed to gain a lot of traction wrt Rank even with relatively lower Reach (in terms of followers) sometimes. This could be because they are early movers in this space from a business pov. Flocks are people engaging in conversations around events esp. in context of a specific subject, which is blockchain in this case. This “flocking” can lead to building of temporal communities with local influence that can lead to virality not obvious by the standalone influence of the individuals or without the context of the event. The flock names below are named on the user/account with most in the flock. Don Tapscott released a book, “BLOCKCHAIN REVOLUTION: How the Technology Behind Bitcoin is Changing Money, Business, and the World”, co-authored with his son Alex Tapscott on blockchain in May 2016. The book, as the title states, is focused on blockchain’s impact on money, business and the world in general. The formation of this flock with dtapscott as the most influential member points to the book having big impact during the analyzed timeframe and explains business, digital economy, banking etc. being one of the top themes we outlined earlier. 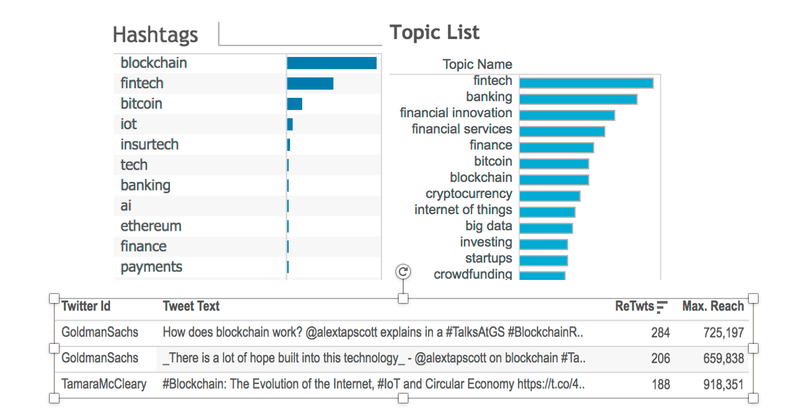 The trending terms, topics and top related tweets (Figure 6) suggest the conversations around this book and business-centric use of blockchain defined and guided the overall direction of the conversations leading to creation of the flock. Looking at the important members (Figure 7) of the flock, it becomes obvious that it consists primarily of the business focused users engaged in the blockchain conversations. 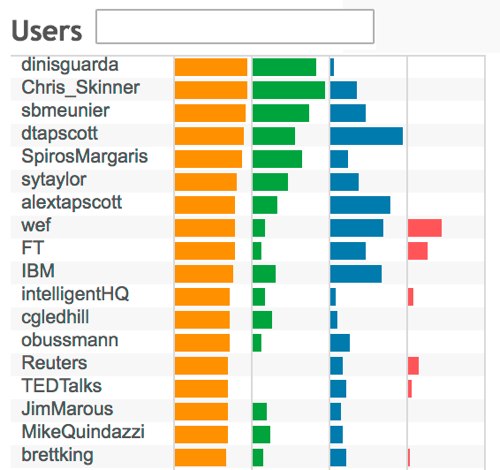 These users, like @dinisguarda, @chris_skinner, @sbmeunier, @dtapscott etc. and so on, are pretty much the same “influencers” identified by betweenness centrality as “connectors” in the business, banking, fintech etc. areas. 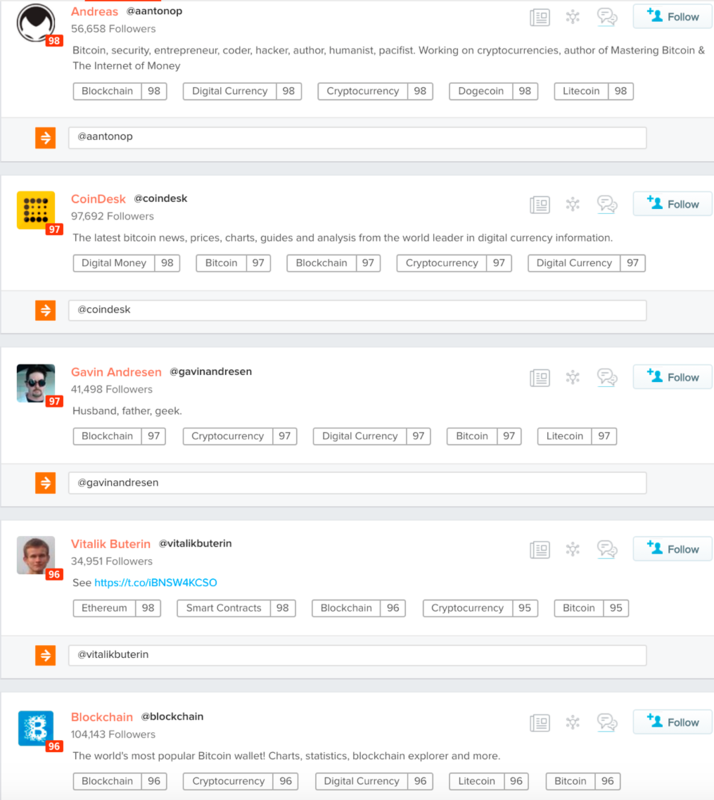 The second major flock has @balajis as the most influential account. 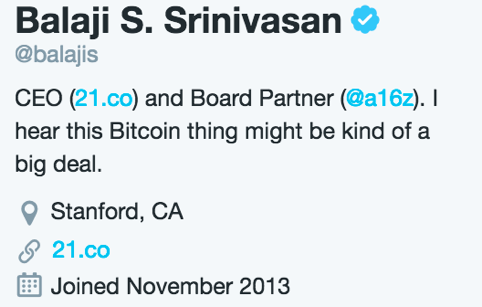 Balaji Srinivasan, from his Twitter profile (Figure 9), is the CEO of 21.co and board partner at a16z. Both 21.co and Andreessen Horowitz are major players in the bitcoin, blockchain and digital currency space both from technology and business point of view. BalajiS is one of the biggest advocates of bitcoin (&blockchain), technology expert and big driver of bitcoin adoption and mining via 21.co. Looking at the hashtags and topics list (Figure 9), the technology focus of the conversations becomes obvious. 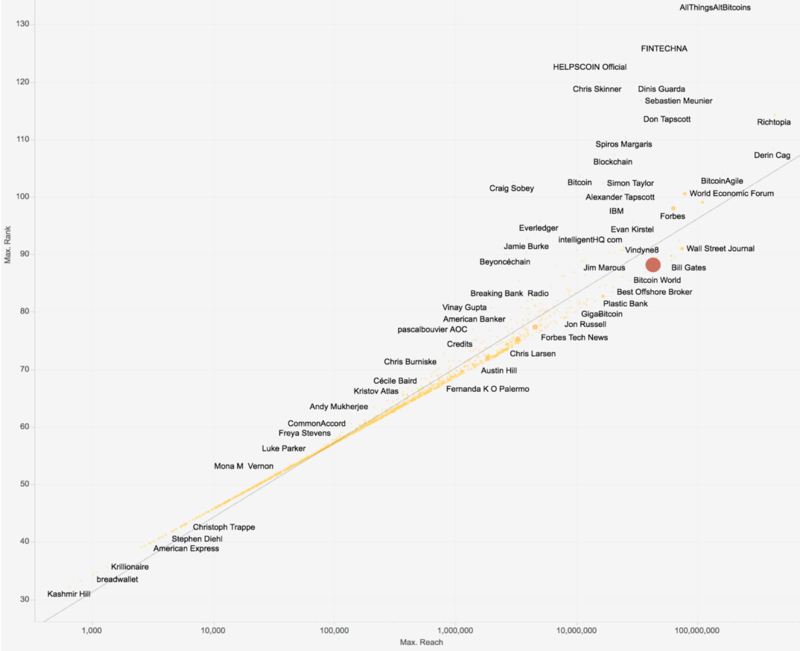 Analysis of the Users (Figure 10) in the flock shows a distinctly technology heavy skew with @pmarca (Marc Andreessen) from a16z making an appearance. This is not surprising since both @balajis and @pmarca are heavy Twitter users, @balajis is a board member at a16z and a16z’s has massive investments in this space. Very interestingly, this flock’s membership is in direct contrast to the business heavy membership of the ‘dtapscott’ flock. @aantonop is well known in the bitcoin space. 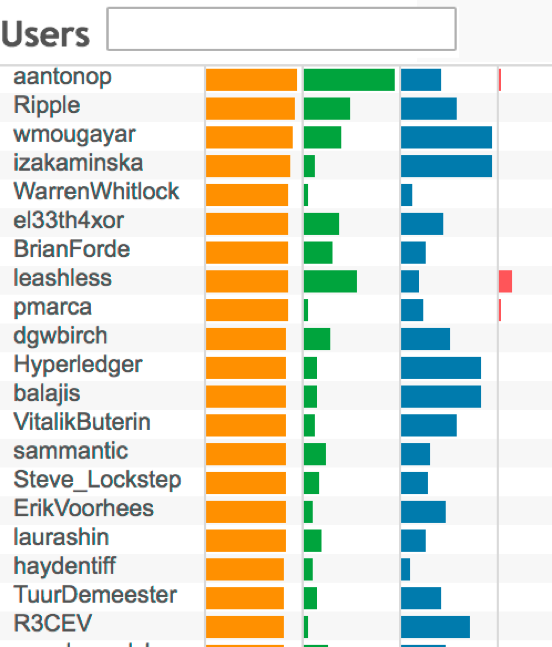 His website (https://antonopoulos.com) states “Andreas M. Antonopoulos is a technologist and serial entrepreneur who has become one of the most well-known and well-respected figures in bitcoin.” @ripple is a global real-time settlement. @el33th4xor, @brianforde, @leashless, @dgwbirhc, @hyperledger, @vitalikbuterin, @sammantic, @steve_locktep, @erikvoorhees are all big technology and entrepreneur names in the digital currency and blockchain space. Another interesting observation is that a particular set of users seems to be security related. Looking at the top tweets, the reason is understood, tweet 3 & 4 are pointing to a security issue with #shadowbrokers releasing an exploit from the NSA and being “rickrolled” in return. Right Relevance uses community detection graph algorithms like Walktrap and InfoMap for identifying communities in our engagements based graph in Neo4j. The communities graph is visualized using Gephi. 1 very technology/developers (Figure 13) heavy. Both have several sub-communities that are outside the scope of this report. 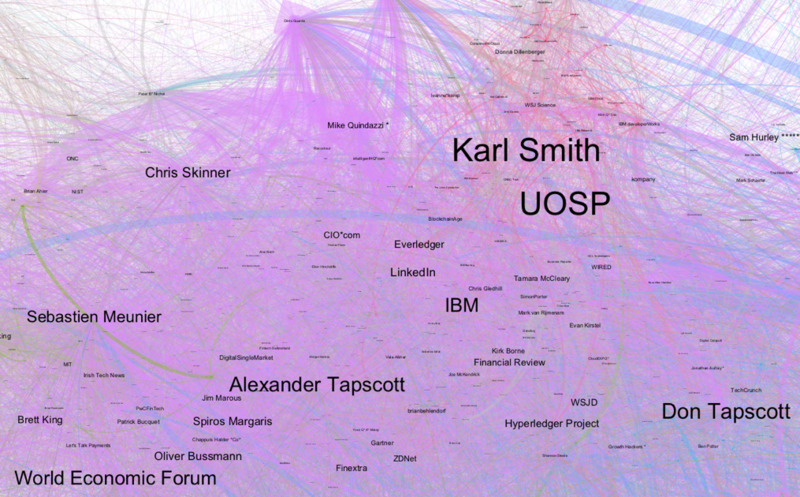 The business-heavy graph clearly shows the World Economic Forum on one side with its own sub-community. Similarly Dan Tapscott, Karl Smith/UOSP, IBM, Hyperledger Project, Dinis Guarda, Chris Skinner, Sebastien Meunier all show smaller sub-communities too. Looking at the sub-graph (Figure 13) around @balajis, one can make out several sub-communities, for e.g. the ‘ethereum’ community of Ethereum, Vitalik Buterin, Erik Voorhess is close together. So, is the a16z/21.co community of BalajiS, 21.co and Marc Andreessen. The bigger Blockchain & Coindesk accounts are closer to the edge of the community and merging with the business community. There is a lot of analysis that we’ve left off from the report due to the scope. Please feel free to contact social@rightrelevance.com to get access to the Gephi graph and dashboard with more details.